Paul Delaroche (1797-1856) was born in Paris and first trained as a landscape painter, a category he abandoned quickly to devote himself to history painting. Delaroche was soon hailed as the leader of the contemporary French school of history painting. In 1832 Delaroche was elected a member of the Académie des Beaux-Arts, and the following year he became a professor at the Ecole des Beaux-Arts, where his pupils included Thomas Couture (1815-1879) and Jean-Léon Gérôme (1824-1904). This painting was executed by Delaroche in 1836 and contrast somehow with his preceding works. It shows St Cecilia, saint patron of music, attending by angels kneeling before her. The very bright palette and somewhat archaic treatment provides a sense of ideal spirituality, which would influence the next generation of painter including Ingres (1780-1867). 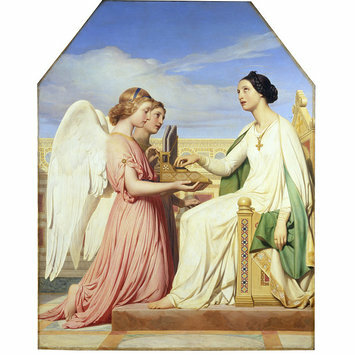 In profile, two angels kneeling before a young woman sat on a throne present a small organ she plays with one hand, her glaze upraised; she wears a white tunic and a green cloak completed by a golden cross hanging from a neck. Pourtalès Collection, sold Paris, March 1865, Lot 247; Delessert sale, Paris 1869, no. 36; James Reiss collection; his daughter, Mrs Henry Jephson, by whom given to the museum in 1903. This painting, executed in 1836 was Delaroche's first first major religious work and was presented at the Salon of 1837. 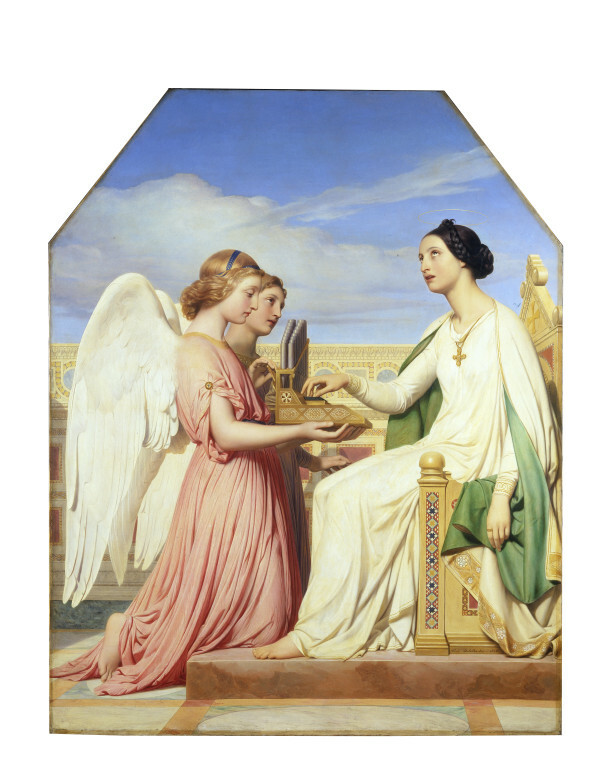 It depicts St Cecilia, dressed in white with a pale green cloak, attended by two angels kneeling before her. The story of St Cecilia goes back to the 2nd or 3rd century. According to the story, despite her vow of virginity, she was forced by her parents to marry a nobleman named Valerian. During the wedding, Cecilia sang to God in her heart, and for that she was later declared the saint of musicians. When the time came for her marriage to be consummated, Cecilia told Valerian that she had an angel of the Lord watching over her who would punish him if he dared to violate her virginity but who would love him if he could respect her maidenhood. When Valerian asked to see the angel, Cecilia replied that he would see the angel if he would convert to Christianity and be baptised. After his baptism, Valerian found an angel standing by the side of Cecilia, crowning her with a chaplet of roses and lilies. Both Cecilia and Valerian were later martyred. Her attribute is either a crown of flowers or a portative organ, such as in the present painting. In this painting, St Cecilia was modelled by Louise Vernet, daughter of the painter Horace Vernet, director of the French Academy in Rome, who married the artist in the chapel of St Cecilia in San Luigi dei Francesi, Rome. Executed two years after the famous painting The Execution of Lady Jane Grey (National Gallery, London), this painting with its archaic treatment surprised the public and was ill received by critics. After 1837, Delaroche ceased exhibiting altogether. 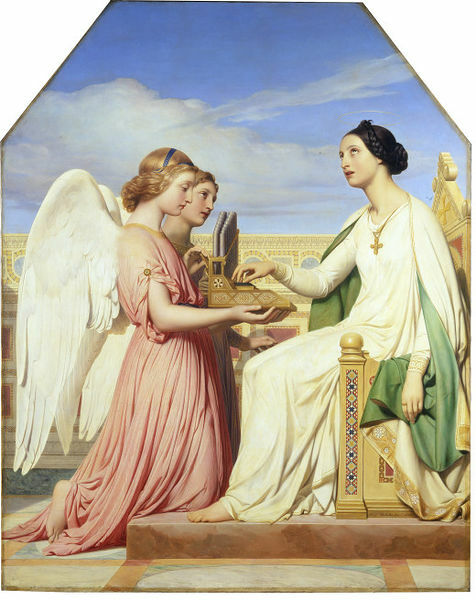 This painting, which borrows elements from the theme of the Annunciation, inaugurated a new phase in Delaroche's output, which would almost exclusively focus on religious subjects onwards. It shows his knowledge of earlier versions of the subject by the Italian masters Raphael and Domenichino. The unusual shape follows that of an early Italian altarpiece and may derive from Fra Angelico's Annunication in the Prado Museum, Madrid (P00015). Delaroche's bright palette, vibrant brushwork and porcelain-like finish would greatly influence the next generation of painters including Ingres and his pupils. History painting, i.e. depictions of non-recurring events based on religious, classical, literary or allegorical sources, particularly developed in Italy during the Renaissance (15th-16th centuries). History painting could include religious themes, or depictions of momentous recent events, but the term was most frequently associated with Classical subject-matter. However a renewed impetus was given to religious subjects after the Council of Trent (1545-63), which stipulated new iconographical programmes. The development of art treatises, in which the compositional rules guiding the art of painting were discussed also notably influenced the evolution of history painting. From around 1600 history painting's principal rivals: still-life, landscape and genre painting began to emerge as independent collectable genres. Furthermore, the Rococo taste for the ornamental in the early 18th century prioritised the decorative quality of history painting, so that subject matters became more entertaining than exemplary. There was a renewed interest in history painting during the Neo-Classical period after which the taste for such pictures faded towards the end of the 19th century, when an innovative approach to the image was led by the Symbolists and was developed further by subsequent schools in the early 20th century. C.M. Kauffmann, Catalogue of Foreign Paintings, II. 1800-1900, London: Victoria and Albert Museum, 1973, p. 29, cat. no. 62. Stephen Bann and Linda Whiteley, Painting History. Delaroche & Lady Jane Grey London, 2010, cat. no. 58, p. 120. S. Bann, Paul Delaroche. History painted, London, 1997, p. 234, fig. 145.